Is it just me or is this idea of exhuming the former pope's coffin and putting it on display a little creepy? How about showcasing vials of his blood so the faithful can gaze at them? This beatification business is just that -- those who can pressure the hardest get their way. The notion that we can somehow decide someone is in heaven by dint of 'miracles' is weird to begin with. 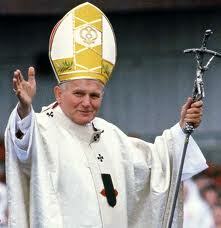 Pope John Paul was great man who deserves whatever accolade his church can give him. He doesn't need to have performed miracles to prove that. He played a huge role in helping free his people from the yoke of Communism. He was flawed like all men but I'd have to say he is a great candidate for the church hall of fame which is essentially what beatification and sainthood is. We dress it up in ritual like a royal wedding and everyone gets very excited but there is a lot of medieval superstition mixed in too. Such as exhuming a body and keeping blood in vials. The church should do away with that stuff it is just too weird and means nothing. Unless you believe in ghosts and witchcraft that is.